On the beautiful campus of Pandit Deendayal Upadhyaya Primary School in Navayard, Vadodara, Dashrath Chauhan and his friends are zealously playing football. 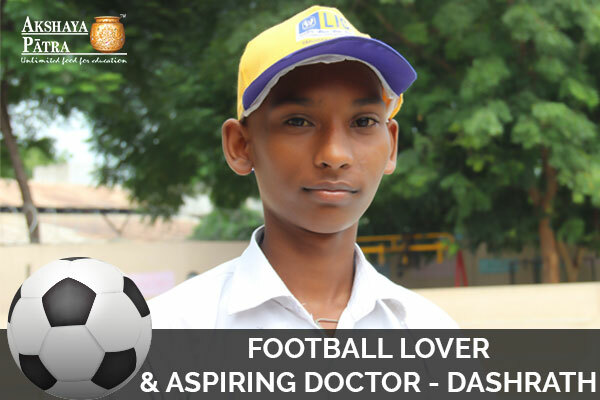 A student of Std VII, Dashrath, an avid sports lover, aspires to be a doctor. “I want to become a doctor, so that I can serve people,” replies the young boy, whose parents are contract labourers for the Vadodara Municipal Corporation (VMC). An avid sports lover, Dashrath’s favourite sport is football, but he enjoys different games as well, including cricket and kabaddi. He enjoys coming to school because he gets to study. He believes that education is important, since it helps people achieve whatever they aim for in life. He counts English, Social Studies, and Math among his favourite subjects. Besides sports activities, Dashrath also actively participates in elocution and essay-writing competitions. On the eve of Yoga Day, he wrote essays on yoga for an essay-writing competition. The youngster has also written on topics like ‘Cleanliness’ for writing competitions held to spread awareness about the Swachch Bharat Mission, along with write-ups on science-related issues and the iconic scientist and former President of India, Dr APJ Abdul Kalam. Talking about the food served by Akshaya Patra in his school, Dashrath says that he looks forward to the tasty mid-day meals every day. They include nutritious dishes like Dal Bhat, Khichdi, vegetables, Dal Dhokli and the likes. His favourite dish, he adds, is Dal Dhokli. His friends too like the tasty meals served by the Foundation in his school, along with his sister Manjula, also a student of the same school. Her favourite dish is Chana Dal, says her affectionate brother, before he sprints off to attend class.